Fidel Castro said Prime Minister Stephen Harper suffers from illusions regarding the extent of resource exploitation and the extensive claims the U.S. has on Canada. In a rambling opinion piece printed in the Cuban News Agency, the 86-year-old leader of the Cuban revolution took aim at the oil sands. "I knew about the damage caused by the Yankees to the people of Canada," writes Castro. "They forced the country to look for oil by extracting it from huge extensions of sand that are impregnated with that fluid, thus causing an irreparable damage to the environment of that beautiful and extensive country." Castro also accused Canadian companies of exploiting Latin America's resources. ". . . Guatemala has put up an admirable resistance against mining projects, thanks to the indigenous populations’ awareness of the value of their territories and their natural resources, which they consider a priceless ancestral heritage. However, in the last 10 years, the consequences of that struggle have been felt in the assassination of 120 human rights’ activists and (sic) advocators." 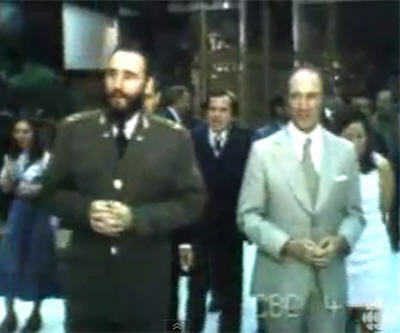 Castro wrote wistfully about Pierre Elliott Trudeau calling him ". . . a brilliant and courageous politician who died prematurely . . ." and intimated that the country has been on the slide since then. Prime Minister Stephen Harper's office declined comment on Castro's statements.